In various geological situations, seismic data provide little or no information about whether a trap is loaded with hydrocarbons or not. In other cases, when the acquisition is difficult and extremely expensive, or the quality of the information is poor due to geology or unfavorable surface conditions, it is the non-seismic exploration methods and, in particular, the unconventional methods of exploration, the only ones that can provide information about subtle stratigraphic traps. In addition, it is well documented that the generality of hydrocarbon accumulations have leaks or microseepage, which are predominantly vertical, as well as that they can be detected and mapped using various non-conventional and not seismic methods of exploration. The benefits in the use of non-seismic and non-conventional exploration methods, integrated with geological data and conventional methods, translate into a better evaluation of prospects and exploration risk; such is the purpose of the present investigation. The geological task posed to the geological–geophysical processing and interpretation consisted in the mapping of possible new gaso-petroleum targets that will base the exploration in the Pina-Ceballos (Northeast of the Central Basin) and Sancti Spíiritus regions. In addition, an evaluation by recognition works of the Redox Complex of several of these possible new targets was envisaged. The mapping of the areas of interest was proposed based on the presence of a complex of indicator anomalies, mainly gravimetric, aeromagnetic, and airborne gamma spectrometric. To this end, the gravimetric and aeromagnetic field at 1:50,000 scale, the airborne gamma spectrometry at 1:100,000 scale and the Digital Elevation Models 90 × 90 m and 30 × 30 m of the territory were processed. The results indicate that the Pina oilfield anomalous complex is recognized, at least, in four other new localities, although with less areal extension; one of them is the Paraíso sector. Other deposits and prospects such as Brujo, Ceballos, and Pina Sur have anomalous complexes similar to Pina’s, but incomplete in some of their attributes. The same happens for other established interest sectors. 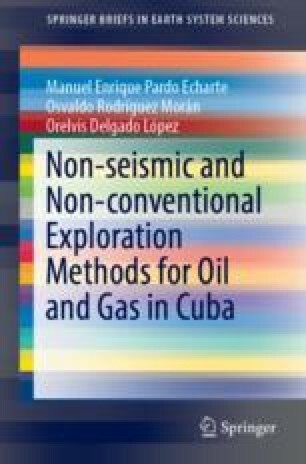 From the use of the Redox Complex, the presence of hydrocarbons in the depth was established in different sectors with indicator anomalous complexes, many of them coinciding with seismic structures. These sectors are, in Ciego de Ávila: Pina Sur, Pina Sur SO, Oeste de Ceballos 1, Oeste de Ceballos 2 and Pina Oeste Norte, and; in Sancti Spíritus, Gálata 2.